THIS ACTIVITY WAS COMPILED BY THE STUDENTS OF 9TH AND 10TH. THE STUDENTS ALREADY HAD A LITTLE KNOWLEDGE ABOUT ANIMATION PROCESS, BUT UNDER THE GUIDANCE OF THEIR RESPECTIVE TEACHERS, THEY COULD COMPLETE AND COMPILE THIS ACTIVITY EXCELLENTLY. THEY WERE THRILLED TO COMPLETE THE ART OF ANIMATION. THEY ALSO COULD PEEP INTO VARIOUS ASPECTS OF SOCIETY AND TRADITIONS, WHILE STUDYING THE FOLK TALES OF U.K., U.S., INDIA AND JAPAN AND THEY FELT ELATED TO BE A PART OF THIS ACTIVITY. 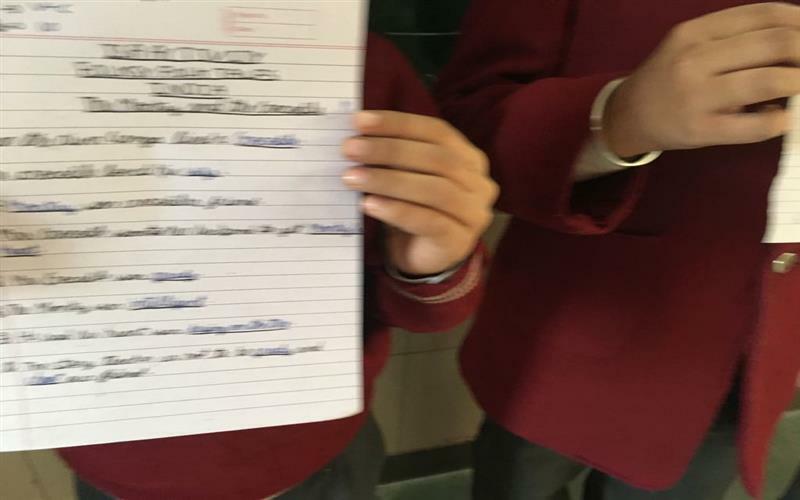 THE ACTIVITY WAS CONDUCTED IN CLASSES 8TH AND 9TH WHERE THE STUDENTS PUT IN A LOT OF EFFORTS TO GO THROUGH MANY FOLKLORES OF THE COUNTRIES - U.K., U.S., INDIA AND JAPAN, THEY WERE VERY CURIOUS AND INQUISITIVE ABOUT THE FOLKTALES THEIR TEACHERS HAD OPTED FOR THE QUIZ. THE TEACHERS READ THE TALES IN THE CLASS FOLLOWED BY THE QUIZZING SESSION. THE STUDENTS ENJOYED THE ACTIVITY WHICH ALSO HELPED ENHANCE THEIR SKILLS. THIS ALSO HELPED THEM HAVE A DEEPER INSIGHT OF SOCIAL HISTORY, CULTURES AND TRADITIONS OF THE ABOVE MENTIONED COUNTRIES. STUDENTS OF CLASSES 3-5 FILLED IN COMPREHENSIVE WORKSHEETS DESIGNED BY THEIR TEACHERS TO ASSESS THEIR UNDERSTANDING OF THE FOLK TALES SHOWN TO THE CLASS ON THE SMART BOARDS. THE TALES WERE CHOSEN FROM INDIA, JAPAN, U.S. AND U.K.
STUDENTS OF CLASS 6TH AND 7TH EXUDED CROSS- COUNTRY CULTURE BY ENACTING FOLK TALES OF U.K., U.S., JAPAN AND INDIA AS PART OF THE ISA ACTIVITY FOLKSY FOLK TALES- MORNING ASSEMBLY ENACTMENT. STUDENTS SHARED CROSS- COUNTRY CULTURE, RELIGION AND TRADITION THROUGH THEIR ENACTMENT OF TALES OF THE RESPECTIVE COUNTRIES WITH THEIR PEER GROUP. LENDING GLOBAL APPROACH TO THE ACTIVITY WAS THE UNDERLINING MOTIVE OF THE ENTIRE ACTIVITY TO HELP THEM SUSTAIN IN THIS GLOBAL ERA AND ADOPT LOVE, CARE AND SENSITIVITY TOWARDS CROSS- BORDER CULTURE AND TRADITION.